Ceramic Beauty Globes... as Katy Perry said: "You're hot then you're cold..."
You're yes then you're no"
OK, I'm just being silly, but when we added Ceramic Wonder's Ceramic Beauty Globes and I saw you can use them hot or cold for facials and other treatments, I REALLY was singing that song in my head. 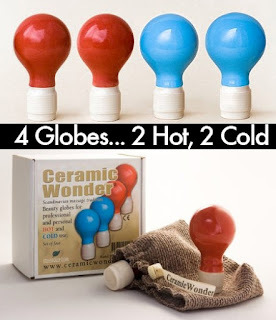 Anyway, these amazing easy-to-clean ceramic globes are the ultimate new and innovative therapeutic tools for beauty and health purposes. Their ceramic composition allows them to maintain the desired temperature, whether heated or chilled. All that aside, they are made in a 300 year old ceramic factory in Estonia! In the year 1718, Peter the Great visited Tallinn in Estonia and fell in love with the city. So, he decided to build a royal palace for himself and his wife, Katherine. Since mass amounts of bricks were required for the construction, the Russian Tsar ordered that a bricks-producing factory be built in the neighboring island of Koply, where a large natural source of blue clay had been discovered.